Hummers LK, Wigley FM. In:Imboden J, Hellmann D, Stone J, ed. Current Diagnosis & Treatment of Rheumatic Diseases, 3rd edition. New York:Lange Medical Books/McGraw Hill, 2013:214-223. Varga J, Denton CP, Wigley FM (Editors). Scleroderma: from Pathogenesis to Comprehensive Management. Springer-Verlag London Limited, 2012. Boin F, Wigley FM. 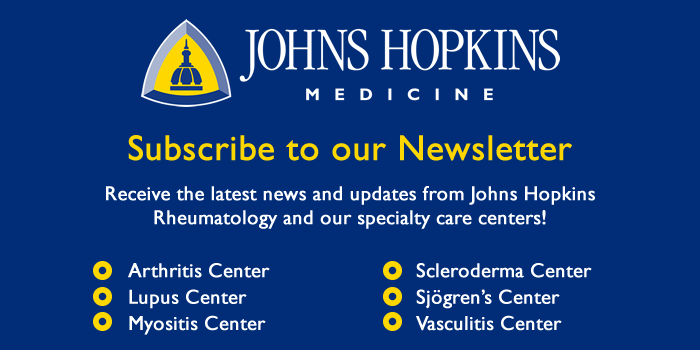 Clinical Features and Treatment of Scleroderma, In “Kelley’s Textbook of Rheumatology, 9th Edition”, Elsevier, 2012:1366-1403. Shah AA. Overlooked Manifestations, Varga J, Denton CP, Wigley FM), In Scleroderma: From Pathogenesis to Comprehensive Management, Springer-Verlag London Limited, 2012:559-570. Varga J, Wigley F. Systemic Sclerosis. In: Rich, Shearer, Fleisher, Schroeder, Weyand, Frew, editors. Clinical Immunology (3rd Ed). Elsevier Ltd., London, UK, 2008:813-823. Boin F, Wigley FM. Systemic Sclerosis. In: Bartlett SJ, Bingham C, Marcic M, editors. Clinical Care in the Rheumatic Diseases (3rd Ed). ACR. Association of Rheumatology Health Professionals, Atlanta, GA. 2006:193-198. Hummers LK, Wigley FM. Scleroderma. In: Imboden J, Hellmann D, Stone J (eds). Current Rheumatology, Diagnosis & Treatment of Rheumatic Diseases, 2nd edition, McGraw-Hill, New York, NY, 2004:189-197. Wigley FM. Scleroderma (Systemic Sclerosis). In: Goldman L, Ausiello D, editors. Cecil Textbook of Medicine (22nd Ed). WB Saunders, Orlando, FL. 2004:1670-1677. Wigley FM, Herrick A, Flavahan N (Editors). Raynaud’s Phenomenon – A Guide to Pathogenesis and Treatment. Springer Science+Business Media, LLC, 2015. Fava A, Boin F. Historical Perspective of Raynaud’s Phenomenon, Wigley FM, Herrick A, Flavahan N (Editors). Raynaud’s Phenomenon – A Guide to Pathogenesis and Treatment. Springer Science+Business Media, LLC, 2015:1-11. Shah AA. Traumatic Vasospastic Disease, Wigley FM, Herrick A, Flavahan N (Editors). Raynaud’s Phenomenon – A Guide to Pathogenesis and Treatment. Springer Science+Business Media, LLC, 2015:129-140. McMahan ZH, Paik JJ. Raynaud’s Mimics, Wigley FM, Herrick A, Flavahan N (Editors). Raynaud’s Phenomenon – A Guide to Pathogenesis and Treatment. Springer Science+Business Media, LLC, 2015:163-85. Hummers LK. Systemic Vasospasm, Wigley FM, Herrick A, Flavahan N (Editors). Raynaud’s Phenomenon – A Guide to Pathogenesis and Treatment. Springer Science+Business Media, LLC, 2015:267-277. Wigley FM. Practical Approaches to Treatment: Case Studies, Wigley FM, Herrick A, Flavahan N (Editors). Raynaud’s Phenomenon – A Guide to Pathogenesis and Treatment. Springer Science+Business Media, LLC, 2015:373-381. Sherber NS, Wigley FM. Skin Manifestations of Raynaud’s Phenomenon, Matucci-Cerinic M (ed), In Rheumatic Diseases and the Skin, Springer Science+Business Media New York, 2014:185-190. Sule S, Wigley FM. Raynaud Phenomenon. In: Imboden J, Hellmann D, Stone J, ed. Current Diagnosis & Treatment of Rheumatic Diseases, 3rd edition. New York: Lange Medical Books/McGraw Hill, 2013:209-213. Wigley FM, Herrick AL. Raynaud’s Phenomenon, Varga J, Denton CP, Wigley FM (eds), In Scleroderma: From Pathogenesis to Comprehensive Management, Springer-Verlag London Limited, 2012:313-330. Hummers LK. Vascular Biomarkers, Varga J, Denton CP, Wigley FM (eds), In Scleroderma: From Pathogenesis to Comprehensive Management, Springer-Verlag London Limited, 2012:247-254. Wigley FM. Raynaud’s Phenomenon and Sjogren’s Syndrome, Ramos-Casals M, Stone J, Moutsopoulos HM (eds. ), In Sjogren’s Syndrome, Springer-Verlag London Limited, 2012:209-225. Wigley F, Wung PK. Painful digital ulcers in a scleroderma patient with Raynaud’s phenomenon, Silver RM, Denton CP (eds. ), In Case Studies in Systemic Sclerosis, Springer-Verlag London Limited, 2011:95-105. Wung PK, Wigley FM. Systemic Sclerosis and Raynaud’s Phenomenon. In Weisman M, Weinblatt ME, Louie JS, & Van Vollenhoven RF (eds). Targeted Treatment for Rheumatic Diseases, 1st Edition. Elsevier, Philadelphia, PA. 2010:157-165. Huston KK, Stone JH, Wigley FM. Digital ischemia and Raynaud’s phenomenon, In: Ball GV, Bridges Jr SL, editors. Vasculitis. Oxford University Press, New York, NY. 2008:209-223. Wigley FM. Clinical manifestations and diagnosis of the Raynaud phenomenon. In: UpToDate, Rose, BD (Ed), UpToDate, Waltham, MA, 2007. Wigley FM. Overview: Cardiovascular Manifestations and Management, Varga J, Denton CP, Wigley FM (eds), In Scleroderma: From Pathogenesis to Comprehensive Management, Springer-Verlag London Limited, 2012:311-312. Wigley FM, Lima JA, Mayes M, McLain D, Chapin JL, Ward-Able C. Reply. Arthritis Rheum 2006;54(1):380-1. Manno R, Wigley F. Scleroderma in the Elderly. Nakasato YR, Yung RL (eds), In Geriatric Rheumatology: A Comprehensive Approach. Springer-Verlag London Limited, 2012:275-286. Sule S. Pediatric Rheumatic Diseases. In: Bartlett SJ, Bingham C, Marcic M, editors. Clinical Care in the Rheumatic Diseases (3rd Ed). ACR. Association of Rheumatology Health Professionals, Atlanta, GA. 2006:141-144. Boin F, Chizzolini C. Immunological Mechanisms, Varga J, Denton CP, Wigley FM (eds), In Scleroderma: From Pathogenesis to Comprehensive Management, Springer-Verlag London Limited, 2012:165-190. Hummers LK. Scleroderma Mimics, Varga J, Denton CP, Wigley FM (eds), In Scleroderma: From Pathogenesis to Comprehensive Management, Springer-Verlag London Limited, 2012:103-112.